Daredevil Recap: I’m Not a Monster, Am I? Daredevil’s episode six finally reached my expectations for the series, but “Shadows in the Glass” far exceeds them. Perhaps this is because we concentrate on Wilson Fisk rather than Matt Murdock. Charlie Cox has given Matt the perfect blend of tenacity and dangerous idealism, and his powers are always fun to explore. And obviously his fight sequences are more fun to watch than Fisk’s, which generally make me feel a bit sick. But he clearly doesn’t have a plan, not really. That means that other than kicking down doors and telling everyone he’s not bad! Fisk’s the bad one! he doesn’t have much purpose in this growing web of villainy he’s become enmeshed in. Perhaps because he’s taken so low in this episode, he’ll — but let’s not get ahead of ourselves. Madame Gao: I speak many languages. Madame Gao: All of them. Matt goes to Blake just as Hoffman poisons him, and apparently gets what he needs to go to Urich. See, Matt immediately found out about Foggy and Karen’s dealings with the reporter and scolds them for what they did. 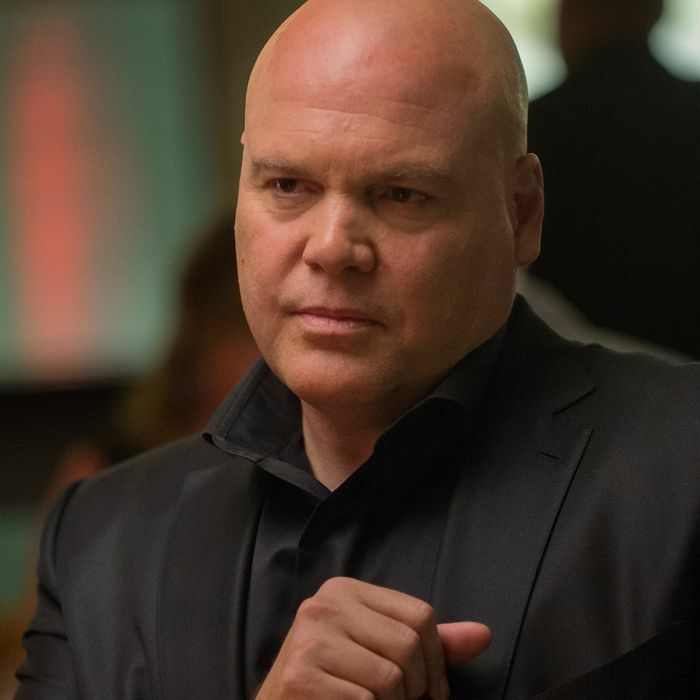 Even as he pushes away his friends, he follows their methods, giving Urich an interview and Wilson Fisk’s name. He even tells Urich that he’s not a killer, saying, “I keep telling people that.” Dude, you have no chill. Don’t go opening up about your insecurities as a superhero to a journalist! Even one as bad as Urich. Even Superman doesn’t do that. He is in high contrast with Fisk this episode — he wakes up to his apartment still destroyed from last night’s fight with Stick. Meanwhile, Fisk’s modern apartment (those floor-to-ceiling windows, oh my) is more than immaculate, it’s pristine, and no wonder — he looks in his mirror and sees a little boy covered in blood. We go back to the 1970s and see that, unlike the love and understanding Matt received from his father, Fisk’s father was a bully, abusive toward him and especially his mother. His rages mirror Fisk’s murderous rage toward Anatoly as he beats up a teenage boy for saying he’s a loser. But it’s not quite as deadly, nor as self-righteous, as Fisk is when he smashes his dad’s head in when the man beats his mother with a belt. (These scenes were emotionally gut-wrenching even as they were horrifying.) He relays this story to Vanessa, whom Wesley has brought over in his time of need. Vanessa (like his mother) is understanding and soothes him by telling him it’s not his fault. You can see why Fisk likes Vanessa; he’s respectful of women thanks to his beloved mother, who calmly sawed his father into pieces and put him into a bunch of trash bags. But that painting also clearly made a mark on him, reminding him of a very strange time in his past life during a new low point in his present life. And just as Urich attempts to write up his exposé on Fisk, he comes out of hiding, out of the darkness, thanks to Vanessa’s advice. The idea of a villain with a good PR campaign is relatively unexplored by Marvel, whose villains usually have a plan fueled by a skewed idea of reality, but no real confidantes or plan. But now it’s Matt who has no confidantes and no plan, and is really suffering for it, as he realizes when he hears Fisk’s speech. Fisk’s father takes a loan from Rigoletto, whom Fisk apparently chopped into little pieces before the season began. Loved seeing the detail of Matt using a braille computer with headphones when he, Karen, and Foggy attempt to use the law against Union Allied, but that made him listening to Fisk on a regular laptop at home seem peculiar. Wouldn’t he use a radio instead? The way Wesley brings in Vanessa in her hot white dress was amazing. Also, that dress is clearly a size too small for her, but man it really does wonders for her figure. According to Nobu, “Black Skies are extremely rare.” Jeez, do I want to know what a Black Sky is? Also, while the three wake-up scenes were brilliantly done (I really want an omelette made by Wilson Fisk now), this is the gazillionth time they’ve used Bach’s “The Prelude” from Cello Suite No. 1 to denote “fanciness.” The other times were during both of Fisk’s dates with Vanessa. We get it, he’s rich and fancy. Dip into some Chopin, why don’t you.